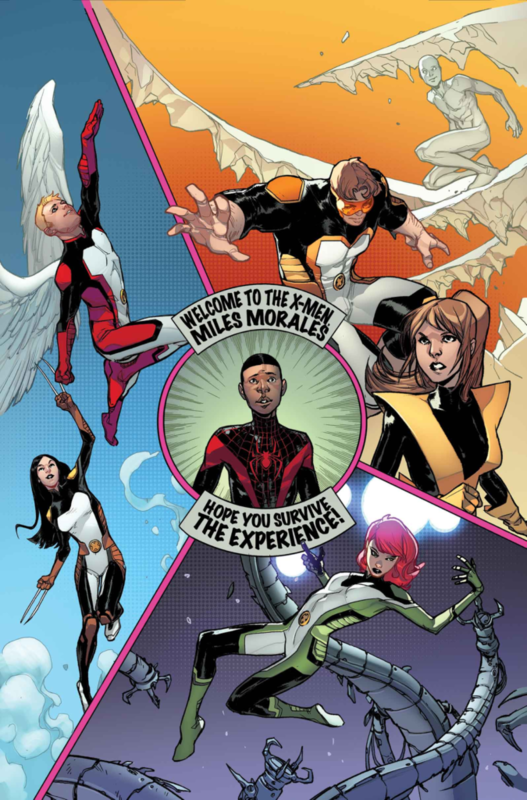 The second issue of the new All-New X-Men story arc has arrived and not very much else happens. All-New X-Men has to be considered one of the best things to come out of Marvel Now!,but it definitely hasn’t been perfect for the whole run. The weakest arc so far in my opinion was The Trial of Jean Grey (this comic’s first crossover with Guardians of the Galaxy ) and I’m afraid this crossover may not be much better. The only difference here is that it’s more of a cameo than a crossover. Instead of the Guardians this time, we get to see the team interacting with Miles Morales and the ultimate universe. The creative team for this issue was solid as it usually is. The writer of this issue was the man who only crosses over with other books that he writes, Brian Michael Bendis. The artist here was Mahmud Asar along with the colorist Marte Garcia. Letters were done by VC’s Cory Petit. The cover was done by Sara Pichelli and Marte Garcia. Issue #32 picks up right where they left off last time with our team stranded in the ultimate universe. As we saw last time, our whole team is currently separated and are all scattered throughout the world. 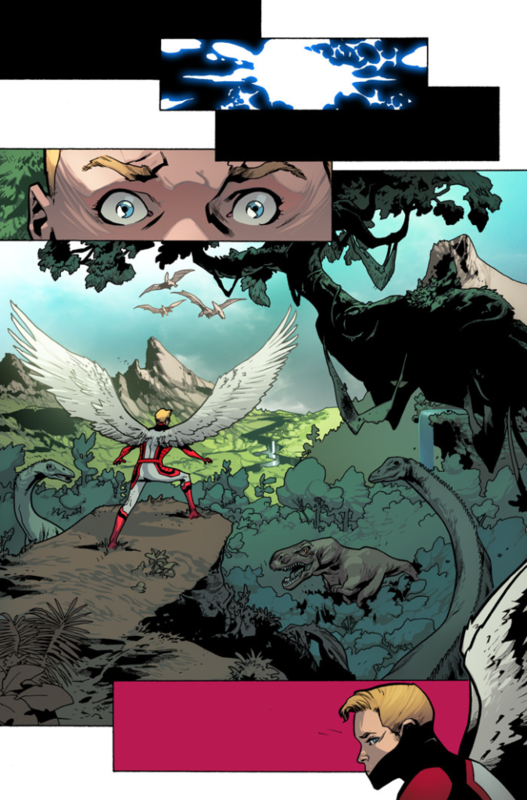 Angel is in the savage land, Beast is in a European country, X-23 ends up in a football game, Iceman is in Moleman’s domain and Jean Grey is in New York with Miles Morales (Ultimate Spider-man). 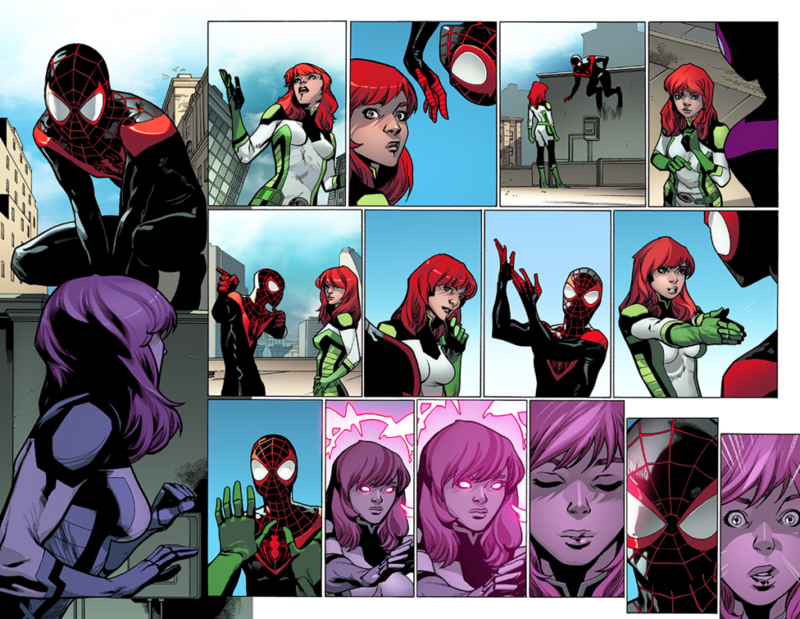 Jean Grey and Miles Morales then make a futile effort to get them back to their home dimension. The author of this issue was Brian Michael Bendis. Bendis has been doing great work on this book, but he made some critical mistakes in this issue. The biggest flaw in this issue was that he separated the whole team. This didn’t allow for the incredible character interactions Bendis is known for and it forced him to give a couple pages to each of them making it hard to form any story lines to really progress. Mahmoud Asar did the art for this issue. His art is rather good, but it’s also inconsistent and occasionally looks a little sloppy. He does have a good overall image of the characters though. Although All-New X-Men is one of my favorite books, I wasn’t too fond of this issue. It didn’t have much plot or character development and seems to be a sloppy method of getting Miles into this comic. I still have faith in Bendis to make this a good arc, but this issue didn’t help much.